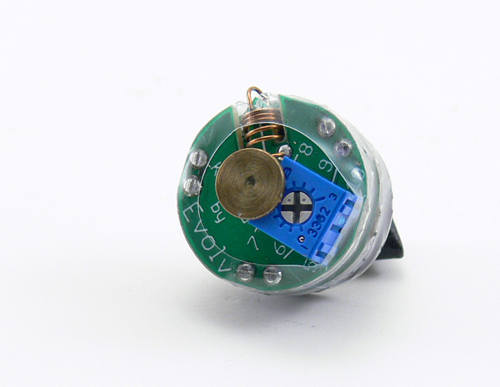 The Kick by Evolve is a simple way to enjoy variable voltage using an existing mod. The Kick is not an electronic cigarette, but rather an additional module that allows any 18650 based mechanical switch mod to function as a variable voltage, or more precisely a variable power electronic cigarette. Simply replace an existing 18650 battery with an 18500 or 18490 battery topped off by the Kick and begin enjoying all the vapor variable voltage has to offer! 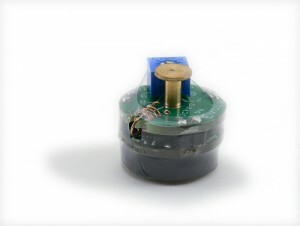 The physical design of the Kick is relatively simple. A circuit board with a potentiometer is visible through a layer of protective shrinkwrap. That shrinkwrap is there to isolate the positive and negative components, by the way, and should not be removed. 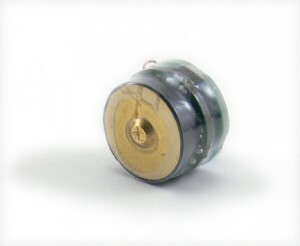 The bottom plate contacts the positive end of the battery and a post on the top provides the positive connection to whatever device is being used. A spring on the side of the Kick is designed to contact the tube of the mod to provide a negative connection for the Kick’s microprocessor. 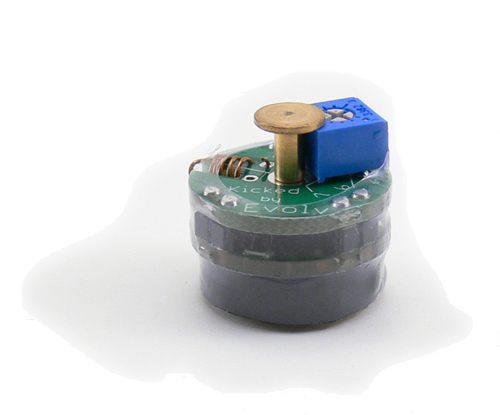 The potentiometer has markings that can be used to get a sense of where the power is set, but trial and error plays a large part in getting things just right. Like the Darwin by Evolv, the Kick regulates voltage but in a slightly different way than most variable voltage electronic cigarettes. Rather than simply deliver whatever voltage it is set at, the Kick instead varies the voltage and amperage to deliver the desired amount of power no matter what resistance atomizer or cartomizer that is attached. A lower resistance atomizer means that less power is needed to produce the same amount of heat and vapor, so the Kick adjusts accordingly. In practice, this means that the voltage changes in response to the atomizer that is attached, but the vaping experience should stay relatively equal. Minimizing the necessity of changing the voltage is a good thing in this case. Due to the nature of the Kick being an internal modification to an electronic cigarette, the device must be taken apart to access it. Once the Kick is exposed, a small screwdriver is needed to change the power setting via the dial on the potentiometer. There really isn’t any way around this process, but it’s not that troublesome. Most users will find a comfortable setting and forget about it. In use, the Kick is pure pleasure. I tried it with an Altsmoke Omega which is not on the list of tested devices, but it is a metal tube mod designed for an 18650 battery and worked with the Kick flawlessly. Setting the dial in a low to middle position of around 4 gave me lots of vapor and great throat hit using 1.7, 2.0 and 3.2 ohm cartomizers. Tests under load bear out the effectiveness of the Kick’s design, with power staying consistent no matter what cartomizer is attached. The table below shows the variation in voltage and the resulting power calculations at various settings with different cartomizers attached. Slight variations in the power recorded between cartomizers are likely due to fluctuations in the resistance of the cartomizers, but it does appear that the maximum power output of 5.5 volts was reached on the partially depleted battery used for the tests. Of course, the boosting of the voltage comes at the price of battery life. Evolv mentions a 10-20% decrease in battery life compared to using the same battery with a standard device, and based on limited tests, that sounds about right. One 18500 battery lasted most of a day during moderate use. Battery life will be impacted by usage and power setting. 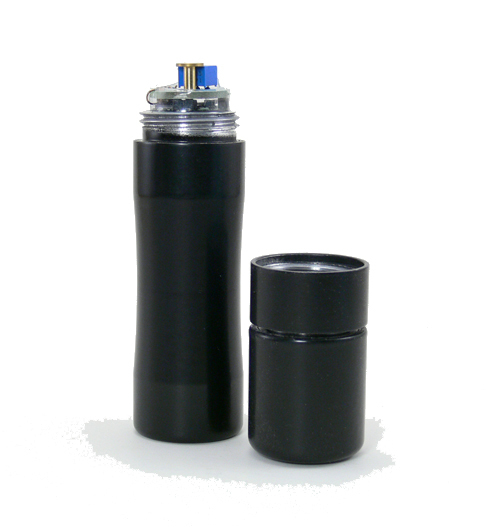 The Kick is a well designed and well packaged enhancement for an electronic cigarette that would otherwise not be capable of providing variable voltage. Some of the best looking mods available fall into this category, so having this additional option is nice. It could also be very attractive to do-it-yourself types who have the desire to create their own personal mod but are not ready to dabble in the electronics necessary to produce variable voltage. Finally, the Kick is an excellent way to get the variable power functionality of the Darwin at a much cheaper price. An XHaler and a Kick from NHaler will set you back about $135, for instance before batteries. That’s somewhere in the middle of the variable voltage price range, but far less than the price of a Darwin and a pretty good deal for the functionality that the Kick provides. Perhaps the biggest problem with the Kick is finding one; as of the writing of this article, NHaler, Altsmoke and Electronicstix all had them listed for $45 and were all out of them.